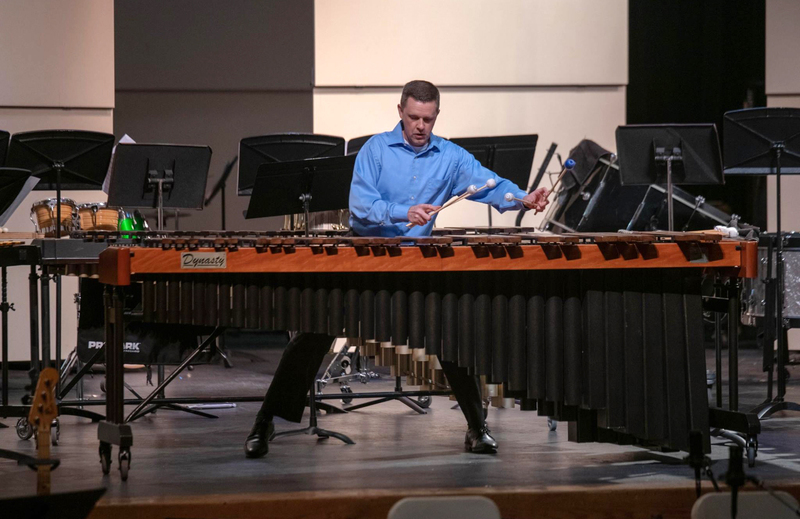 Klein Oak High School welcomed home alum turned world-renowned percussionist, Dr. Brian Zator, last week for a special, one-night-only performance with today’s generation of Panther percussionists. Zator’s homecoming after 26 years serves as a testament to the Promise2Purpose vision that was implemented long after he graduated from the district but clearly lives inside of him. He returned to the auditorium stage with more credentials and wisdom, but the same spirit and passion that embodies Profile of a Leader. Applauding the foundation that Klein ISD Fine Arts afforded him, Zator knows that students graduating from his alma mater will also be thoroughly prepared for future success, regardless of what that looks like. For two days leading up to the concert, Zator invested one-one-one rehearsal time with the students performing in the concert with him. Junior Stephen Mann was inspired by the experience of learning from and performing with Zator. “I have a similar plan for my future, so seeing Dr. Zator, who grew up in Klein ISD like I have, and all that he has accomplished, gives me the confidence to know that anything is possible,” he said. Zator currently serves as the Director of Percussion at Texas A&M University-Commerce, is a proud member of the Royse City ISD Board of Trustees and recently fulfilled a two-year term as President of the worldwide Percussive Arts Society. As a Forever Learner, he truly exemplifies an insatiable desire to grow and improve.